Virginie the owner was very friendly and helpful. The apartment was well equipped and comfortable. It was also quiet. It felt very safe and secure. Also it was really helpful having a parking space. Riquewihr is a lovely town. The size and decoration of the apartment impressed from first entry, it was large enough for our stay and the balcony provided a perfect sitting area for the end of day relaxation and chat. The apartment is situated within 200 metres of the lower town gate and allows for easy entry to the town during the evening when you can stroll around the town without other visitors being in the camera lens for the "perfect" picture. The write up can be easily abbreviated to "Superb"
Lovely sweet owners of this great, clean two bedroom apartment. Wonderful balcony. Felt like we lived in Requewhir. Travelled about visiting other villages and sites. Great flat at the beginning of town! We stayed 4 nights in this flat, using it as home base during our exploration/travels of Alsace. It had everything we needed (including parking) and Virginie is a great host! Beautiful village and we would stay here again. Friendly and easy to communicate with. They took care of the flat and i would welcome them again with pleasure. 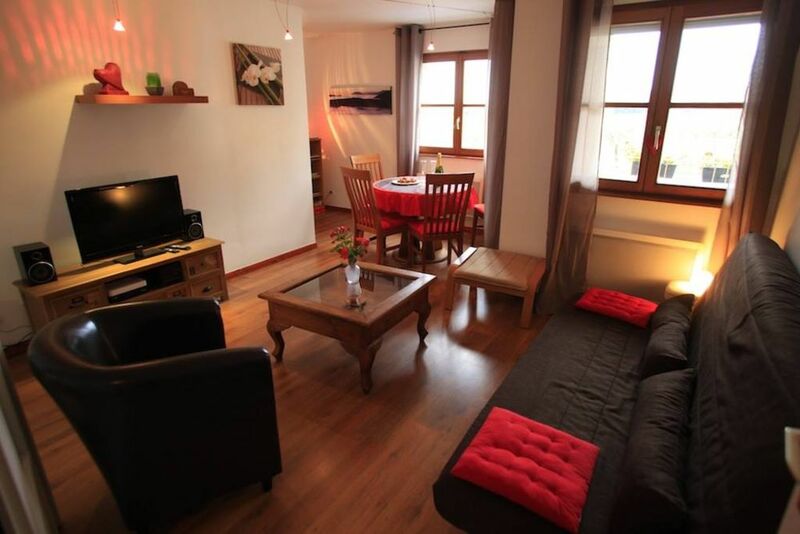 Lovely flat in the beautiful village of Riquewihr. Stayed here on a family vacation, wonderful patio, excellent location with nice amenities. Owners are friendly and helpful. Thank you for a wonderful stay! Touristes charmants et agréables, respectueux de l appartement, à qui je louerai à nouveau avec plaisir. (Text automatically translated) At the conquest of medieval castles, to the exhilaration of a downhill ski or bike for a ride in the Grand Cru vineyards of Alsace, to experience a taste of our local cuisine, the magic of markets Christmas, you will find a variety of entertainment for the whole family.